To say I have always been fascinated by the Berlin Wall is an understatement. From the time I was a young child, my father spoke to me of serving in Germany. Some of his ancestors had come from Germany and it was a country he thought quite beautiful. As a child I grew up in school learning very little about the Berlin Wall. I think my fascination and obsession with it started the day I watched the Disney Movie “Night Crossing”. I wondered what would be so terrible that two families would risk their lives and the lives of their children to escape to the west side of the wall. I didn’t understand the Cold War. So began my journey. I have so much more to learn. Fortunately I have a group of sixth graders this year who have as big a fascination as I have. It has fueled me to move forward once again. When given the opportunity to review this book was thrilled. I expressed my desire because I have been working on a time-travel historical fiction book of my own. Anything and everything I can learn about the people, politics, “legends” is more information to move me forward. This book did not disappoint. 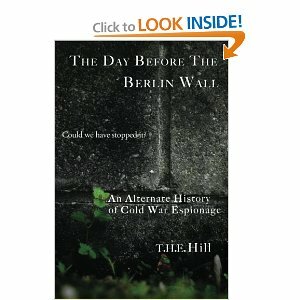 From the back of the book we learn that the plot is based on a legend passed around about a U.S. knowing in advance that a wall was to be constructed and if the Americans became aggressive they were to stop building the wall. T.H.E. Hill has created a character in the form of army sergeant working the “east” side by the name of Dieter, who comes across the information that a wall is to be built. He is accused of murder, a set-up to prevent him from getting the information back to the west side. The problem comes in when you have your side and the other side after you. I won’t say anything further because I think everyone interested in this time period should read this book. One thing I found fascinating was the double ending. The reader is given a choice of how to end the fictional account, “correct or fictionalized”. I of course had to read both.